Relationships + Writing = WOW! I have this funny kind of writing relationship with my mother. I write about my mom…and she doesn’t think it’s funny. Oh, lots of other people do. People like editors buy my funny essays and publish them in books or newspapers or magazines. But the one time I shared a humorous published story about mother dear, she wasn’t very dear at all. It started out well enough. She laughed a bit at the beginning of my mother-daughter tale. She thought it was funny when I poked fun at my foibles. But somewhere between the middle of the story and the point where I explained how I’d learned everything I (didn’t) know from my mom, things turned a bit dicey. So, if you ever come across anything I’ve written, and Mom’s in the piece, I hope you’ll laugh–and love my funny mom as much as I do. But don’t mention it to her, huh? ‘Cause when it comes to my writing about Mom and putting it out there for all the world to see…well, mum’s the word. What’s my Mother-Daughter writing relationship have to do with anything today? So glad you asked! Today I’m participating in a mass blogging! WOW! Women on Writing has gathered a group of b logging buddies to write about family relationships. Why family relationships? We’re celebrating the release of Therese Walsh’s debut novel today. 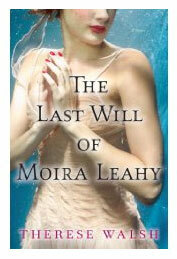 The Last Will Of Moira Leahy (Random House, October 13, 2009) is about a mysterious journey that helps a woman learn more about herself and her twin, whom she lost when they were teenagers. Visit the Muffin to read what Therese has to say about family relationships and view the list of all my blogging buddies. And make sure you visit Therese’s website (www.theresewalsh.com) to find out more about the author. I have the same problem with my children. Readers think the essays are hysterical. My kids(with all their antics exposed to the world)are not as thrilled. Too funny! And, thanks for the heads-up about the book and blog! Linda,My oldest writes-but so far, just poetry (which I honestly do not understand). So I think I'm safe. :-)Kelly,Bet you'd love that blog. I can't wait to read Therese's book!